You guys! An asteroid almost hit Earth last week! Separately-but-relatedly, a meteorite did explode and hit Earth last week! And it all makes the perfect introduction to the book I finished reading a few weeks ago…because, that book was set in space!! Maybe that seems like a reach…bear with me! The characters were frequently reminding the reader that one didn’t even need bombs – all that would be necessary to wage war from space on planetary life was dropping rocks. The meteorite last week brought this powerfully to mind. One of the books I included in my dad’s Christmas booklist was an adventuresome-sounding space tale called Leviathan Wakes, by James S. A. Corey (pseudonym for a writing team composed of Daniel Abraham and Ty Franck, who is George R. R. Martin’s assistant). It was one of those situations where I read the book description and instantly thought of someone, in this case, my dad. 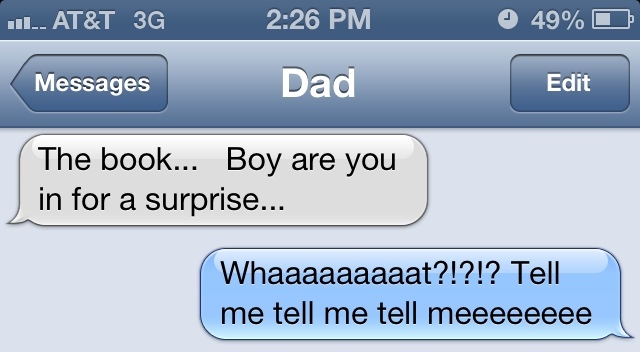 I was speaking to my mother on the phone last month when I heard my dad laughing in the background. “He’s really enjoying his January book,” my mom says. “He’s been laughing a lot.” My curiosity had been piqued by this story, too, and as part of my ongoing efforts to broaden my reading horizons, I decided to read this book “with” my dad. Leviathan Wakes is set in the indeterminate future: the human race has colonized Mars and many moons and the Asteroid Belt, but hasn’t ventured any further. Tensions abound between Earth and Mars (the inner planets) and between Earth, Mars, and the “Belters”, represented by the Outer Planets Alliance (or the OPA). Told in the alternating viewpoints of James Holden, the XO of an ice mining ship, and a detective named Miller who works on a space station, the action starts pretty much right away, and doesn’t really stop until the story closes. For the record, he didn’t tell me anything. He can be so irritating. It was super-exciting, y’all, and really a lot of fun imagining a life in a time and place so different from my own. Reading outside your comfort zone can be really rewarding. If you haven’t tried it lately, there’s no time like the present! 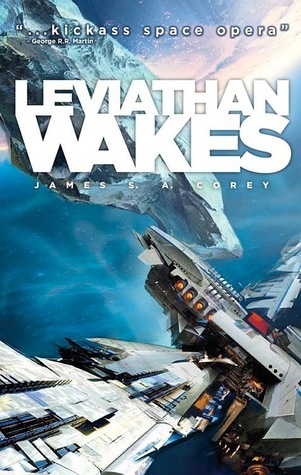 This entry was posted in Books, Reviews, and Reading and tagged books, James S. A. Corey, Leviathan Wakes, science fiction on February 21, 2013 by ms.grammarian.